Authorities called to the scene of the senseless attack said they could do little to control the large crowds of dangerously bewildered citizens, many of whom searched desperately for some semblance of meaning in what had just taken place. While officials have yet to determine the purpose of the attack, a number of potential theories have emerged, including the sudden deregulation of the U.S. economy, the destruction of culturally significant landmarks, and maybe the fact that man, in his essence, is no more than a collection of irrational fragments, incapable of finding reason where no reason exists. Hmm. Sounds like a Christo project. And makes about as much sense. A friend and I refer to Christo as “The Art Murderer”. A couple of people died during the installation of The Umbrellas, and it struck us that viewing it as a scenario for a perfect murder could finally explain Christo’s work. The theory being that, decades ago, he decided to kill someone, but didn’t want to go to jail. So he carefully goes about preparing a reputation as an artist who constructs very large, apparently pointless works of art. Once his style is well known, it’s now possible to have a carefully crafted “industrial accident”, causing no suspicion because large art is a risky business and accidents happen. The mysterious large artworks of the past were merely elaborate preparation of an alibi. 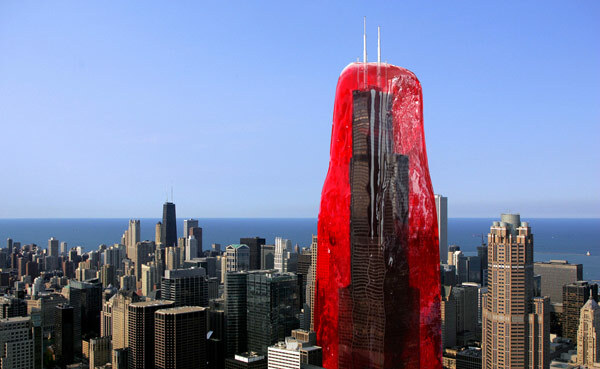 I’ve always liked jello. To understand the purpose of the attack, you’d probably need to know what flavor it was.